We all blasted through the front door a few hours ago, feet dirty and a bit exhausted from a full day of blueberry picking — something that’s become a bit of a family tradition in late July ever since Oliver was born. We have photos out in the field with O in the baby carrier, chubby legs swaying in the breeze while I obsessively applied sunscreen every ten minutes. Last year found Oliver and his friend Lewis traipsing through the rows of berries together in the late morning hours, eating more than we ended up taking home. This year’s photos tell a different story: Oliver and I in a big open field used for overflow parking, he sitting on his little potty, me singing songs and chatting away, the sun beating down on the two of us. We’re deep in the thick of potty training, so as it turned out, Sam and Oliver’s Aunt Christa did the brunt of the picking today. But Oliver and I had some good talks while staying hydrated, people watching, and eating Sour Cream and Onion Kettle chips. Not a bad way to spend a morning. And really, it’s never about how many berries we bring home because neither of these years have proven to be particularly bountiful, but it just never feels like high summer until we get out there and start filling our buckets, however slowly. I’d promised you a savory baking recipe today but I’m still testing it, so instead I bring you mixed berry scones! And no, I didn’t just whip these up using the berries we picked this afternoon because, well, I’m just not that much of a sorceress. 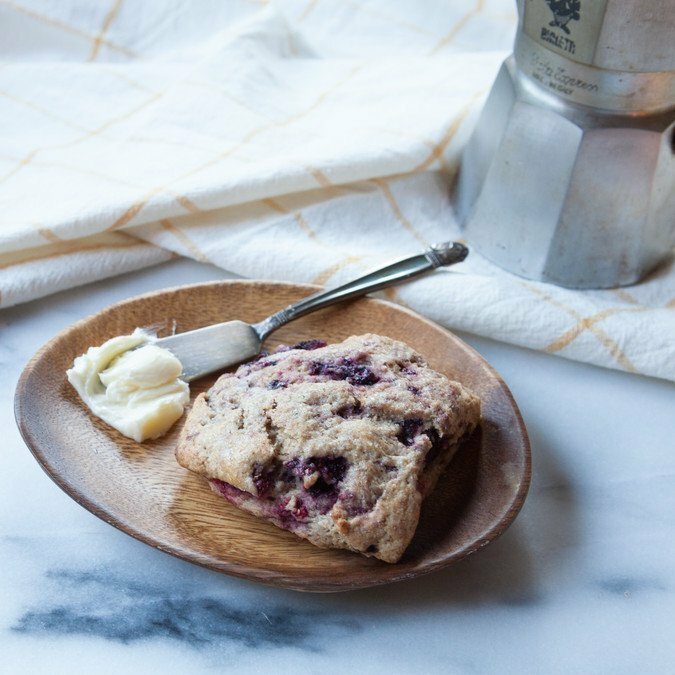 But I love this scone recipe for a few reasons, most importantly: their simplicity. 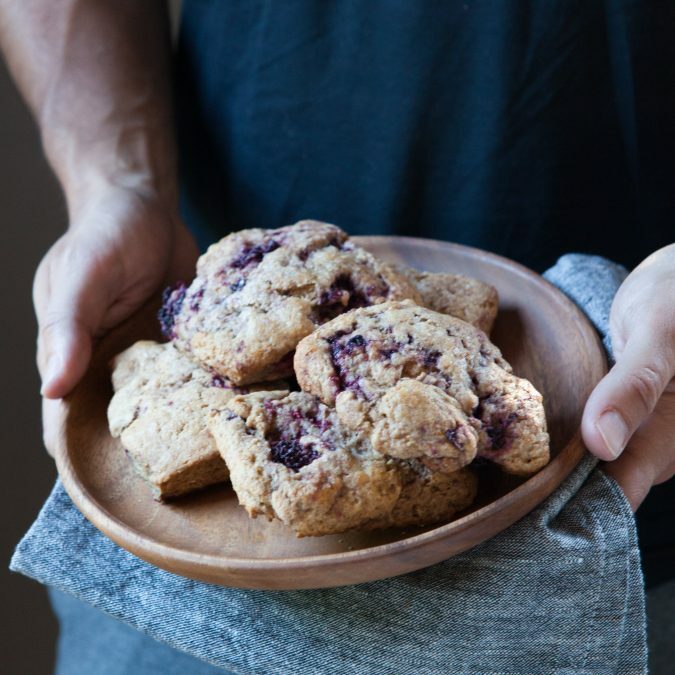 I flirted with the idea of calling them Vacation Scones — you know those recipes you kind of keep memorized or you kind of roughly pull together when you’re traveling and they manage to somehow always taste great? For me, I can make an impromptu fruit crisp wherever I may be without a recipe and can make pretty respectable pancakes. These scones are simple enough to start to add to that list: they don’t have any fussy ingredients (I’m looking at you, lemon zest), they don’t require any rolling or turning or cutting butter into the dough (I use a food processor for ease and speed), and they’re easily adaptable. I dig them. An American Marriage by Tayari Jones: I’m ashamed to say I have a few pages left of this novel and there’s no good reason (other than I can’t keep my eyes open at night) because it’s such a rich, beautifully-written story and I can’t recommend it enough. On the surface it’s about a marriage, but it speaks so much to the different kinds of love, how time changes people, and the different versions of ourselves that we discover along the way. Like a Mother by Angela Garbes: I haven’t read this book! So why recommend it? I have MANY friends who have and it’s on my ‘next to read’ list. I love the recent handful of books coming out that speak to a bit of a different experience of pregnancy, labor and motherhood than is portrayed in What to Expect When You’re Expecting. From the description, “With the curiosity of a journalist, the perspective of a feminist, and the intimacy and urgency of a mother, she explores the emerging science behind the pressing questions women have about everything from miscarriage to complicated labors to postpartum changes.” Let’s read this, shall we?! Momrage Podcast: My online homie Amelia Morris has come out with a really interesting podcast along with her friend Edan Lepucki. They delve into questions about motherhood that are often unpopular or skirted around. And I love that they’re doing it; it’s about time. Tully: Ok, so at first I didn’t like this movie. I even texted my friend Julie and commiserated with her about our mutual dislike for it. The day after though, after thinking about it in the shower for quite some time, I decided it actually resonated more than I gave it credit for. I love Charlize Theron and, without giving too much away, this film offers a unique and important glimpse into postpartum mental health. Girls Night In: While I think I’m not necessarily the target age here (I’m guessing it’s more like early 30’s), I’ve been surprised with how much I enjoy this newsletter. It’s really well done, smartly written and always has a few links that interest me. Green Chile Chicken Verde (in the Instant Pot! ): As I mentioned, I (very) reluctantly gave into the craze: I’m the (reluctant) owner of a new Instant Pot and this recipe is calling my name. What else should I make?! Instant Pot Tomato White Beans: It’s been really too hot to do major cooking this week, so when I stumbled across this recipe, it was immediately bookmarked. I’ve heard that making beans in the Instant Pot is a real game changer, and I’m looking forward to keying up this recipe to find out what all the hype’s about. Our Favorite Vegan Ice Cream: More often than not we have a pint of Frankie and Jo’s in the freezer. It’s not cheap, but it’s hands down the best vegan ice cream I’ve ever had and just so happens to be a few blocks from our house (but they also ship!). I love the Berries and Cultured Cream flavor this month. So good. 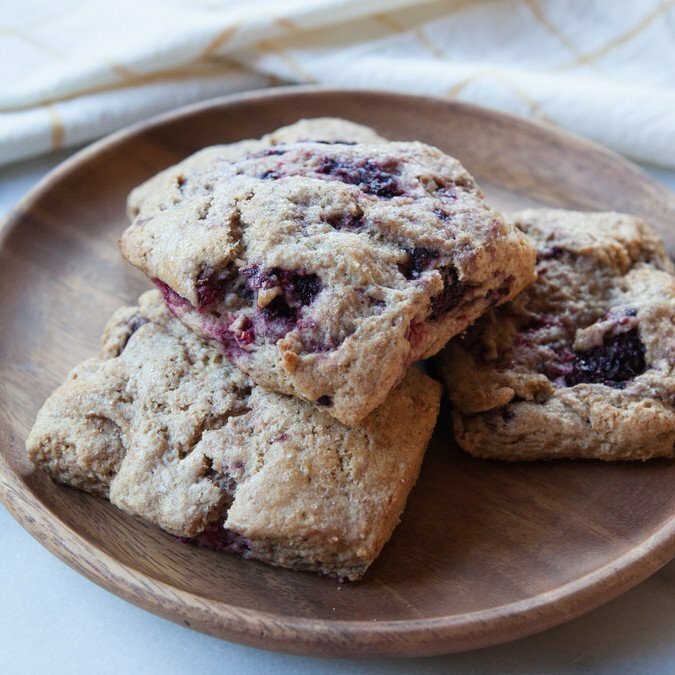 These whole grain scones aren’t too sweet and are a great way to use up a glut of summer berries. Strawberries, raspberries, blackberries or blueberries all work great here (I used a mixture of raspberries and blackberries). As you’re making the dough, remember that flour is your friend: if your dough feels too wet or you’re sticking to your work surface, just add a bit more! These are best the day you bake them, but are still great the second day if stored in an airtight container. 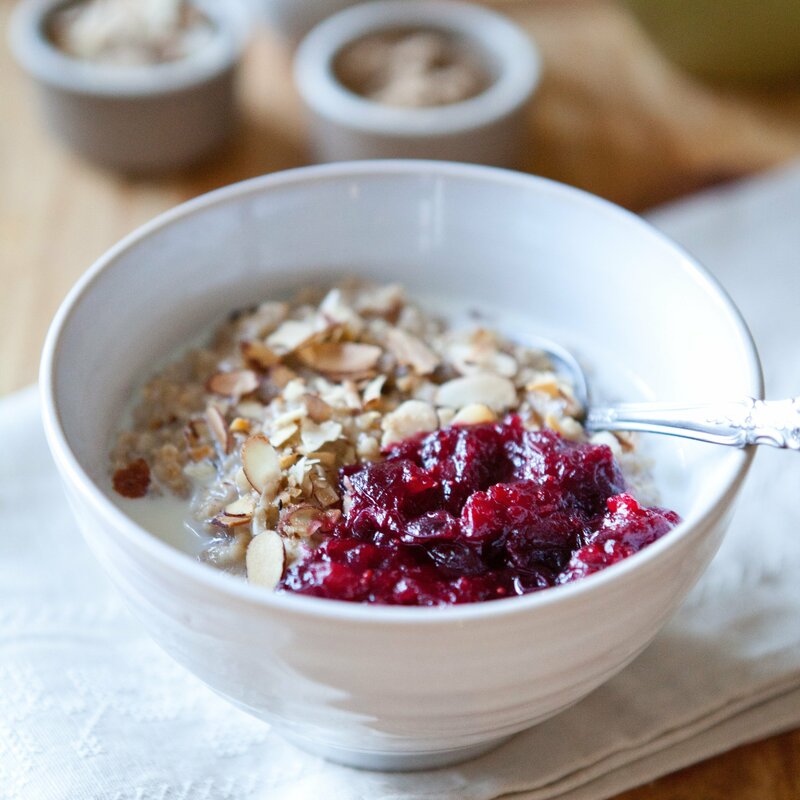 Beyond that, freeze them for future weekday breakfasts. 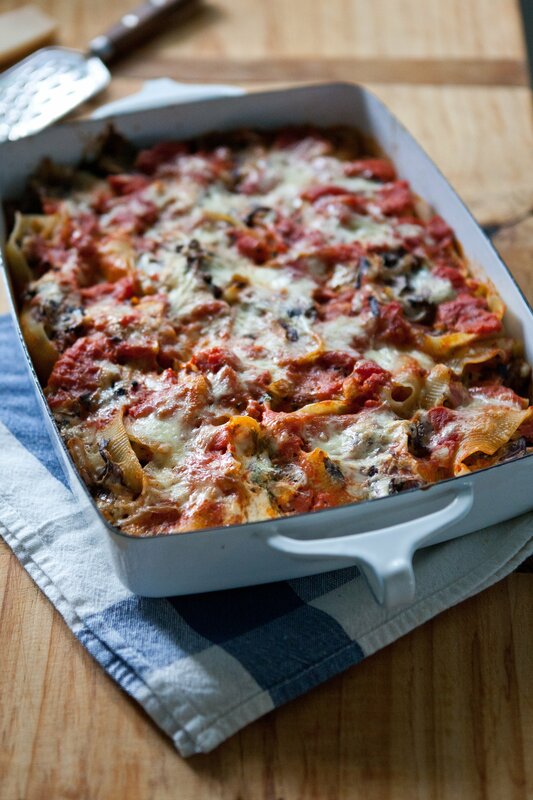 Preheat the oven to 400 F. Line a large baking sheet with parchment paper or a silicone baking mat. 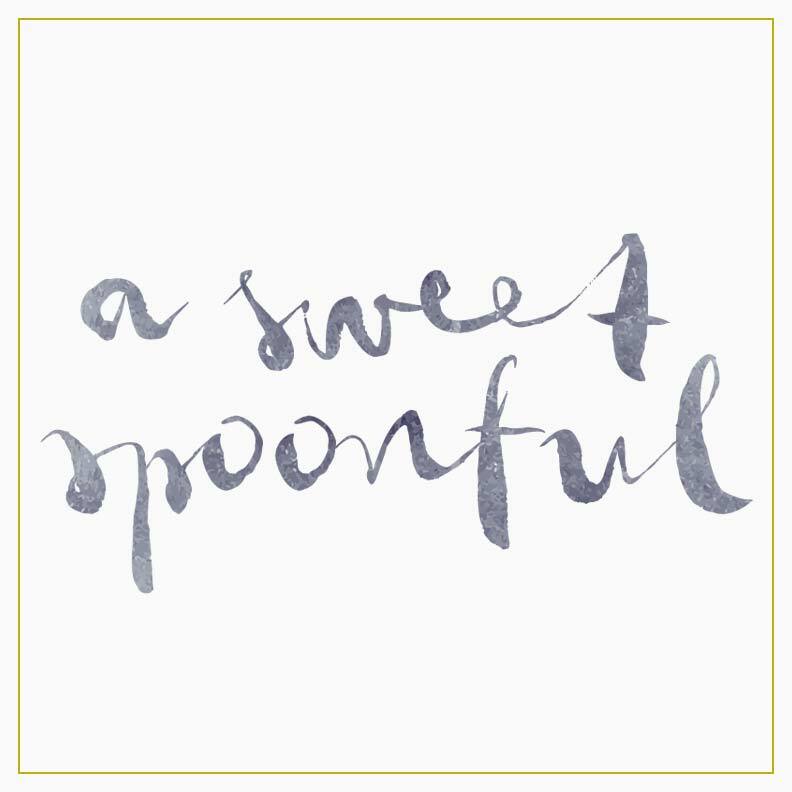 In the bowl of a food processor, pulse together the flour, sugar, baking powder, baking soda and salt. Add the butter and pulse until it’s incorporated into tiny pebble-size pieces. Slowly add the buttermilk through the feed tube, stopping right when the dough starts to come together. Turn the dough out onto a well-floured work surface. 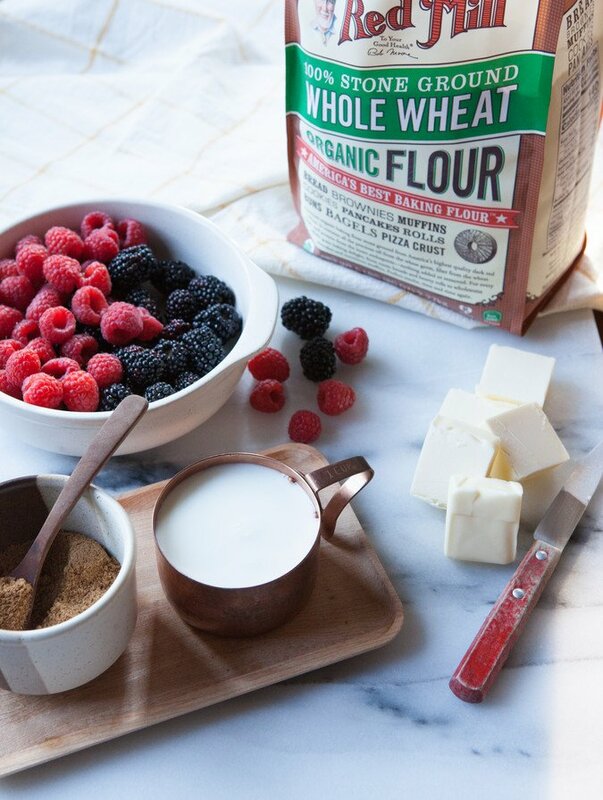 Place your berries on top and fold the dough over a few times until the berries have been incorporated (they’ll likely be kind of hiding in the center layer there, which is great; you can’t mess this step up … just get those berries in there as messy as it may seem). Add a little more flour to the dough if it’s sticking to the surface. Form the dough into a rectangle shape (do the best you can here; it’s totally acceptable to have different shaped scones, so it really doesn’t matter). Slice into 9 large scones or 16 small scones. Quickly transfer to prepared baking sheet. Brush the scones with a little buttermilk and sprinkle with extra sugar. Bake for 20-24 minutes, or until golden brown around the edges. Best if enjoyed within two days of baking. Looks gorgeous. I’ve had great success using nectarines in scones. Yes a place near our house using freshes peaches and nectarines in their scones and they also add some oats and they are amazing! If not planning to eat the scones the day you make them, do you prefer to freeze them before or after baking them? Either one, actually! I'd probably bake them and then freeze them ... that way you're just thawing and warming (vs actually baking off). Enjoy! So much to comment on, unrelated to scones. It's funny how the annual outings progress. We go to a Giants game with our daughter every year. Last year she was a whiny threenager, yesterday she was a fun four year old! "An American Marriage," so good. I have never wanted to be in a book club more to have others to discuss a book with. Mom Rage, loving it. I wasn't familiar with Edan's writing before, but I have now read her second novel and enjoyed it. On that note, I listen to a podcast called "Best of Both Worlds" which is about work-life balance and a lot of tips for time hacks, and one of the things I have gotten from it is realizing I have time to read more - winning! Hi, Margot! I can't believe I haven't commented back until now. I saw your comment come through originally and smiled and thought I commented back but, sigh, alas ... anyway! I'm so glad to hear they get less whiny! THANK GOODNESS. Just finished An American Marriage - what a stunner of a book! Now I'm at a loss for where to turn next that'll be 1/2 as good. I haven't checked out Edan's writing yet but have been meaning to. And thank you for the pod recommendation. I'm always on the hunt for a new one (my commute is a bit long these days). Hope you're having a great weekend, and thank you so much for stopping in to say hello! Seems delicious and the process seems easy going which is excellent for people that love scones and bake. Some of the comments in several sites is people asking for freeze or eat hot. I prefer to eat in the moment or few hours later, taste comes up and the quality is much better i think. all the best and thanks for the post. Oh my gosh, Meggie, thank you for this comment! So glad your tweaks worked out for you and MAN I love that peach cobbler (good nudge for me as we haven't made it yet this year). Thanks so much and enjoy the rest of your week!